Already own in Molokai Villas? Thinking of selling? Click here and read about current search trends & our web network. 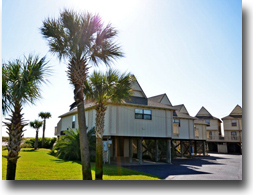 Molokai Villas condos for sale are listed below and along with the current listings is a Google interactive map, pictures, property details and various other bits of useful sales info for the Perdido Key condos at Molokai Villas. The condos feature a first-come, first-serve boat facility on the Northern side of the property. Molokai Villas has a outdoor pool and a fishing pier. A great amenity of the Molokai Villas condos is the location. Molokai Villas condos are located in Western Perdido Key and thereby a short drive to Orange Beach, AL and the various Orange Beach amenities, like the Wharf and Amphitheater, restaurants, entertainment venues, shopping outlets and, of course, Gulf Shores, AL is only about 10 minutes from Orange Beach and has a wide range of great area amenities itself. Molokai Villas condo floor plans are all two bedroom condos ranging in size from 900 square feet to just over 1,200 square feet. This development offers the best of both words with units on Old River and the Gulf of Mexico. Find similar Perdido Key condos for sale featuring complexes on both gulf and river sides such as Needle Rush Point, Seaspray, and Shipwatch. Please let us know if you would like additional info such as, pictures, subdivision bylaws, recent sales figures by emailing info@condoinvestment.com or call (251) Area-Pro (251-273-2776) for immediate assistance or to schedule appointments to view current listings in Molokai Villas or other properties in the area.